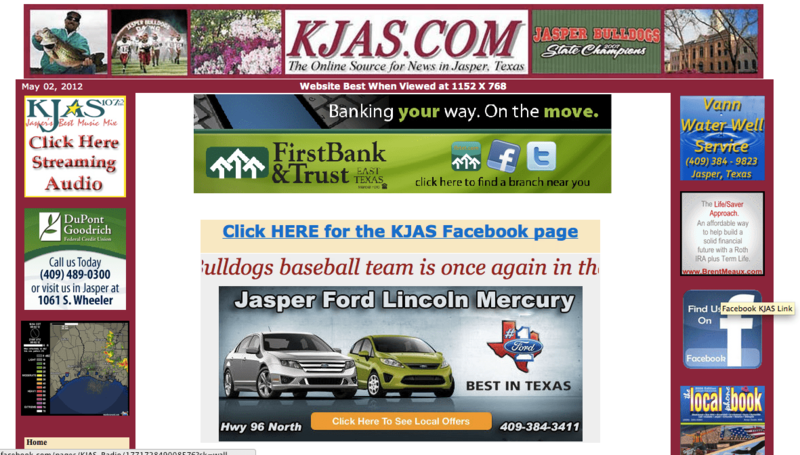 Kjas.com provides you with the latest news from Jasper, Texas. If you enter this site, you will find local news and information, including sport news and local classifieds. What is more, you can listen to local radio shows and music aired by KJAS Radio. Do you live in Jasper, Texas and you want to read the latest local news? If so, you need to enter this site and find all the information you are looking for. Kjas.com gives you not only local news, but also a community event calendar and online classifieds. Additionally, you can get health news, as well as food and lodging information. Remember, next time you need to find local news, pay this site a visit. On Kjas.com you can read community headlines and sport news, in addition to local weather reports and online classifieds. What is more, if you want to listen to local radio and music, this site might be of your interest.